"Suddenly everything 'normal' doesn't feel like enough," mused hair pro Guido Palau while adding tailbone-grazing extensions to the manes of Kiki Willems and Selena Forrest backstage at Tory Burch yesterday. Palau-who whipped up jagged micro-fringe for Tomo Koizumi, exaggerated lengths for R13, and "futuristic Avatar braids" at Tory Burch, all in the span of 72 hours-is clearly not alone in this conviction. Over the weekend, there were fantastical beauty statements in spades on the runways at New York Fashion Week. Pushing makeup into the realm of watercolor painting, abstract, multicolored washes of color encased the gazes at Eckhaus Latta, while nail statements veered into jewelry territory with arresting pearl details at Adeam. And in keeping with the evergreen desire for chic reimagined classics, Brandon Maxwell served up intricate, ballerina-inspired knots and Brock Collection put a smoky twist on graphic black eyeliner. Here, seven hair and makeup takeaways for the year ahead. A jet black kohl pencil is the cool girl's desert-island essential. But just as important as having it is knowing what to do with it. This season offered a mélange of tantalizing techniques. At Brock Collection, makeup artist Gucci Westman accented sharp, inky lines along the upper and lower lash lines with smudges of charcoal pigment, while Maryam Nassir Zadeh enhanced thin, razor-sharp flicks by adding a backdrop of cerulean shadow. And even more dramatically geometric were Marina Moscone's punkish negative-space cat-eyes drawn on extra thick to Cleopatra-like effect. At Nicole Miller, rapper JZL the Empress served up a visual mic drop when she hit the runway with twin pigtail plaits saturated in rainbow dyes and stacked with color-coordinated plastic beads. And keeping up her momentum in her second season, newcomer Indira Scott opened Brock Collection, her taut updo proving to be all the more mesmerizing wound up with her signature wooden-beaded plaits. Upping the ante on a classic braid for all textures, models at Tory Burch received extreme extensions for serpentine plaits that swayed to and fro. And in the spirit of social change, a bevy of Chromat's braided styles made a fierce anti-pollution statement with plastic water bottle tops fastened to the ends. There were several showings of sparkle this weekend. It all began on Friday night at Tomo Koizumi's magical debut, where makeup artist Pat McGrath blended shimmering lilac shadow in a graphic winged shape that perfectly complemented the collection's fairy-tale confections. Then, at Kate Spade, whisper-light washes of rose-gold highlighter were dusted on the upper cheekbones as a nod to the disco-loving '70s. But most extreme of all? The Swarovski crystal-spangled visages at Christian Siriano, worn most virally by muse Ashley Graham amid her constellation of sun-kissed freckles. Trailing down the backs of models at Christian Siriano (and dazzling onlookers from every angle) were polished low ponytails woven with silver chain-mail extensions for a heavy-metal feel. 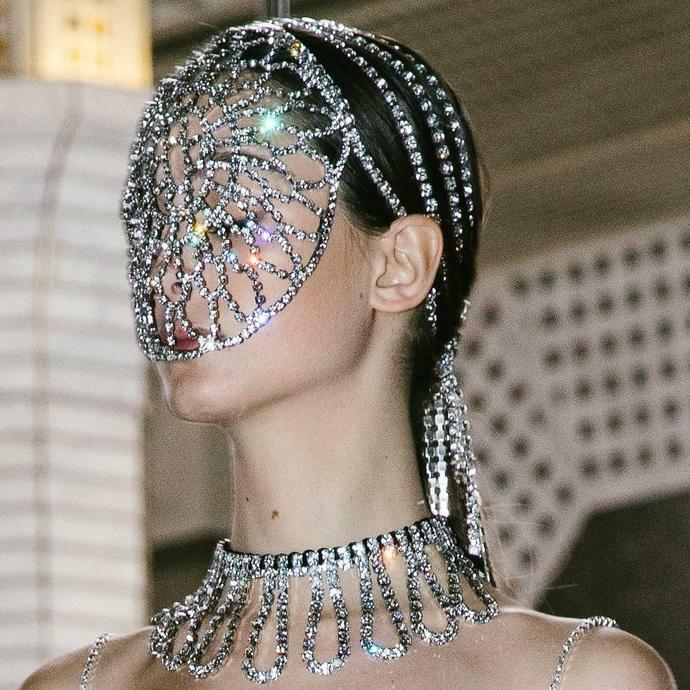 But even more gobsmacking were the collection of scene-stealing crystal mesh headpieces at Area, with light-catching diamanté strands also entwined in beautiful Bantu knots. And in a blink-and-you-missed-it moment at Dion Lee, hairstylist Eugene Souleiman topped off textured knots with a single black ostrich feather affixed on the side. Sleek hair is a mainstay on modern runways, but designers keep finding ways to make slicked-back styles feel fresh. Much like the glossy, deep side-parted updos from Tom Ford and Ralph Lauren earlier in the week, Koizumi opted to keep coifs streamlined and close-cropped but added a subversive slant with choppy, abbreviated fringe. "The clothes are quite over the top, so I didn't want to compete with them," explained Palau. "But I didn't want to go so simple that the girls almost disappeared in the clothes." And at Brandon Maxwell, hairstylist Bob Recine dreamed up a "supersonic ballerina bun," twisting multiple individual sections extra tight then pinning them into place for a sculptural knot equal parts neat and ornate. The tie-dyed gazes at Collina Strada were a harbinger of the painterly beauty looks that followed this weekend, beginning most prominently with Eckhaus Latta, where British makeup artist Isamaya Ffrench used an airbrush tool to create diffused mask-like designs in shades of green, chartreuse, and tangerine. But it wasn't just faces getting the art school treatment. At Jeremy Scott, Souleiman splotched shaggy black bobs with skunky white paint streaks, while at Sies Marjan hairstylist Duffy imbued Rapunzel lengths with neon-bright watercolor pastels like model Harleth Kuusik's salmon pink. Paying homage to what he considers the greatest city in the world, designer Jeremy Scott teamed up with nail artist Miss Pop to have each model's dark digits spell out New York in white lacquer. Sending a similarly loud (and colorful!) message were the sharp talons at Chromat, which tied into the show's efforts to raise awareness about climate change with weather map- and oil slick-inspired prints by Lady Fancy Nails. For minimalists, nail artist Mei Kawajiri placed pearl decals on blush pink and deep sapphire polishes, while at Priscavera nail technician Holly Falcone tapped into the show's heaven-and-hell theme with a negative-space manicure featuring a cherry red reverse-French detail along the cuticles.